‘Grab yourself a mint’ or ‘Sit back my friend, your breath is bad!’ is the common things we hear among people suffering from bad breath. Bad breath or halitosis in its medical term occurs due to various reasons; namely poor saliva flow at night resulting in so-called ‘morning breath’ which is repulsive when we wake up, eating pungent foods such as garlic and onions, poor brushing and dental care, sucking on a thumb or other objects and a range of oral diseases. A common misperception is that bad breath arises from the stomach but it actually arises from the back of the tongue where food collects bacteria living in the mouth, they rot and release chemicals throwing out a bad odor. These chemicals are usually volatile sulfur compounds such as hydrogen sulfide. 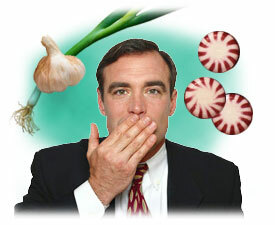 Bad breath is divided into transient and chronic or persistent. The transient is a very common temporary condition caused by oral dryness, stress, hunger (ketosis), eating certain foods, smoking and poor oral hygiene. These type disappears upon chewing a gum and brushing one’s teeth. On the other hand, the chronic bad breath affect other organs than mouth. Bronchitis is an example as we breathe through the nose and mouth. This is also common in diseases such as tonsillitis and pharyngitis. Metabolic products of liver disease gives a ‘fishy-smelling’ and kidney failure gives a ‘urine-like’ odor. Diabetics have a fruity smelling odor. They affect the tissues in the mouth (gums and teeth) resulting in dental decay, periodontal diseases and poor oral hygiene due to plaque development (a biofilm acting as habitat for bacterial growth on uncleaned tooth surfaces). Good dental hygiene – Single most effective method is to brush and floss daily after meals preferably and if you have any mouth guards or oral devices, make sure to clean them thoroughly before putting them back in your mouth. Tongue scraper – It takes 3 minutes to complete all surfaces but we take 30-45 seconds usually. The surface missed allows bacteria to accumulate. In some instances, even with brushing and flossing, bad breath is inevitable due to hidden bacteria in crevices and tongue. Therefore, use a tongue scraper to remove this layer below tongue containing mucous secretions to enhance breath. bacteria. The result is simply exhaling the breath of dead again. Diet – ‘You are what you eat’ so watch the food consumed daily. Foods are digested and absorbed into the blood stream into lungs and when exhaled, they release a terrible odor. Low carbohydrate diet and stress also enhances bad breath. When you don’t eat or are fasting, you may develop ‘ketoacidosis’ releasing an unpleasant “fruity” smell. Avoid foods like onions, garlic, cabbage, fish, milk, cheese and coffee as much as possible. Tobacco products – Smoking leads to periodontal diseases and they have the smoker’s breath. So, kick off this habit , a one step remedy. Eat food that eliminate bad breath – Crunchy, high-fibred fruits and vegetables such as apples, carrots and celery helps to remove food, bacteria and plaque from teeth. Besides parsley, rosemary and eucalyptus are herbs that work well. Gulping down yogurt will reduce the bacterial load in the mouth. Unsweetened green tea contains polyphenols which stops bacterial growth. Chew on a mint or sugarless gum – When you chew gum it makes you salivate more which helps in flushing out bacteria and enzymes in our saliva that kill bacteria. Xylitol is a sugar substitute that not only increases salvation but also works to prevent bacteria from replicating in the mouth. Mouthwashes can only mask but not treat bad breath. The alcohol content can worsen the breath and tends to dry the mouth increasing the possibility. Newer mouthwashes aim to attack volatile sulfur compounds in basic molecular level. Dry mouth or xerostomia – Alcohol causes dry mouth and a dry oral environment aids in the increase production of sulfur compounds because the less oxygen in the mouth, the better for the anaerobic bacteria in the mouth. Avoid beer, wine and whisky as such. Last but no least, visit your dentist for a regular dental check-up and your doctor to find an alternative in the medication prescribed if it causes bad breath. So, come on ladies and gentleman, follow these steps and treat yourself to a fresher breath and healthy mouth!!! Experience the new you and enjoy your social life…. This entry was posted in Oral Care on August 28, 2010 by Mian.